For all ages and households. Globally renowned and admired, the Supreme BB-1000 offers luxury features at the best available price. This bidet seat has the strongest water spray of any on the market in the US today. If a customer asks What has the strongest spray? Or, What has the best enema function? The Supreme BB-1000 is fully featured with a convenient wireless remote, ambient temperature heated seat, soothing warm water wash, and exclusive technologies such as the 3-in-1 nozzle system and the patented Enema wash. The Supreme BB-1000 is Bio Bidets most popular model due to its affordability and constant performance to provide the best cleansing experiences. Its reputation continues to be held in high regard and is upheld by countless satisfied owners. Luxury Class Supreme BB-1000 Bidet Seat. Known throughout the industry for having the strongest spray, the BB-1000 is a workhorse that is also beautifully made. Pamper yourself with a gentle, warm aerated stream. A convenient remote control allows you to personalize several functions including water temperature, pressure, and even offers a gentle cycling massage feature. Follow cleansing with a touch of a button for an adjustable warm air-dry while enjoying the comfort of a gently heated seat. Both features include adjustable temperatures. BB-1000 is equipped with state-of-the-art smart power saving function that calculates the most frequently used hours of the day for maximum savings with a powerful deodorizer that eliminates up to 90% of embarrassing odor. Its patented 1 pocket 3 nozzles allow maximum hygiene with a soothing pulsating massage. Equipped with the most advanced Capacitance seat sensor and Self Diagnose, BB-1000 is truly the most advanced and complete bidet seat in the industry. Quick release for easy cleaning. Tank Reservoir for Heated Water. No cold water shocks, ever. Dependable and performance-driven, the tank type water reservoir is known for its steady stream output and consistent temperature. No cold water shocks and no fluctuation in the water stream. The tank reservoir is the standard in bidet heating methods known for its low energy consumption and solid performance. Since the water is already stored and heated in the tank, you only receive your desired temperature upon selecting it and the water pressure remains steady from start to finish. The Tank Reservoir combines water flow and temperature consistency for the most satisfying experience. The Supreme BB-1000 comes packed with all the luxury features you could want such as the heated seat, heated air dryer, massage and oscillating mode. Experience full control over preference with options such as adjusting nozzle position, pressure, and temperature. You can also control the temperature of the heated seat and air dryer. The 3-in-1 nozzle system includes the signature vortex water stream, excellent posterior wash, and softer feminine wash with bubble infusion technology. Using the toilet and a bidet should be quick and easy. You shouldnt need a manual to figure out how the remote works. We have far more better things to do than trying to decipher which combination of buttons does what. The Supreme BB-1000 remote control is one of the easiest to use with some of the largest buttons found on any bidet remote. Straightforward with full visibility, all main functions are directly on the interface so you dont need to remember a combo code to unlock an everyday feature. The Supreme BB-1000s water pressure and cleansing abilities cannot be beat. Due to the superior technology of the aeration method and the patented 3-in-1 nozzle system, the water stream is always full and provides maximum cleaning. The powerful built-in motor keeps the stream consistent to your preference whether it is the gentle feminine wash or the robust posterior wash.
Another feature on the Supreme BB-1000 is the exclusive and patented Vortex wash (also known as Enema wash) which works as an effective and natural way to assist with bowel movements. Powerful Deodorizer with Active Carbon. 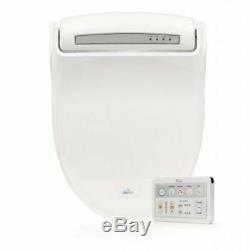 The item "Bio Bidet BB-1000 Supreme Bidet Toilet Seat Round withRemote Open Box Special" is in sale since Wednesday, May 2, 2018. This item is in the category "Home & Garden\Home Improvement\Plumbing & Fixtures\Bidets & Toilet Attachments". The seller is "clearwaterbidets" and is located in Carlsborg, Washington. This item can be shipped to United States, Canada, United Kingdom, Denmark, Romania, Slovakia, Bulgaria, Czech republic, Finland, Hungary, Latvia, Lithuania, Malta, Estonia, Australia, Greece, Portugal, Cyprus, Slovenia, Japan, China, Sweden, South Korea, Indonesia, Taiwan, Thailand, Belgium, France, Hong Kong, Ireland, Netherlands, Poland, Spain, Italy, Germany, Austria, Bahamas, Israel, Mexico, New Zealand, Philippines, Singapore, Switzerland, Norway, Saudi arabia, Ukraine, United arab emirates, Qatar, Kuwait, Bahrain, Croatia, Malaysia, Brazil, Chile, Colombia, Costa rica, Panama, Trinidad and tobago, Guatemala, Honduras, Jamaica, Viet nam.